There was contention to go around Monday at the Ocotillo Performing Arts Center as the candidates for the Eddy County Commission debated ahead of the June election. The battle regarding the legality of the current commission’s use of county funds to hire an independent contractor for the County Assessor’s office and candidates’ pasts were hot-button issues at the debate. The debate between District 2 candidates Royce Pearson, incumbent, and Jon Henry began with heated words right out of the gate as moderator Gene Dow’s first question regarded rumors of both sides looting one another’s campaign materials. According to Pearson’s rebuttal, someone has been maliciously stealing his campaign paraphernalia. Pearson was later asked why he voted “yes” to hiring an auditing firm from Arkansas at a cost of more than $750,000 to perform an audit of oil and gas companies doing business in Eddy County. “The Supreme Court has ruled that county tax assessor should go ahead with the oil field audit; in our first meeting in April, we did vote 5-0 to hire the contractor,” said Pearson. “The only thing that would happen if we refused to hire the contractor is we would be back in court. Henry said he would have voted “no” on the issue regardless of the Supreme Court’s orders. Other issues the candidates discussed concerned the cost of the previously mentioned audit, legalization of Sunday packaged alcohol sales, the usage of social media, and the 2016-17 fiscal year budget. 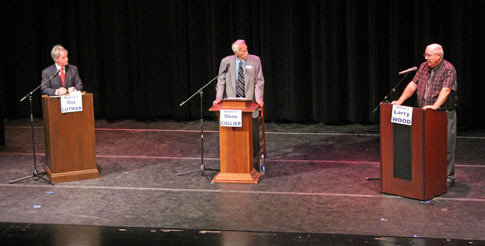 The debate between District 3 candidates Glenn Collier, incumbent, Larry Wood and Guy Lutman followed. The first question issued regarded Collier’s age and how that might affect another term as a commissioner. Perhaps the most controversial issue during the second debate was Wood’s departure from the Artesia Magistrate Court and any hindrance it might have on his performance as a commissioner. The District 3 candidates also discussed the oil and gas audit. Lutman’s rebuttal included his past term on the Eddy County Commission. Wood agreed with the way the current commissioners voted on the issue. At 6 p.m. today at the OPAC, a second debate will be held, this time for Eddy County sheriff’s candidates Mark Cage, Kelly Lowe and John Patterson, and treasurer candidates Frank Barrera and Laurie Pruitt.